Winter may be right around the corner, but that doesn’t mean you have to throw in the towel on those outdoor home improvement projects. 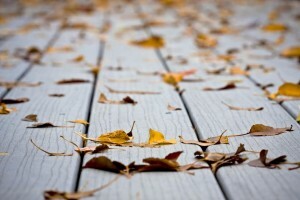 There is still plenty of time to build that new deck you have always dreamed of. In fact, fall is the perfect time to start! Deck and fence companies tend to be busiest during spring and summer, when the weather is warmest and people spend more time outdoors. This can make it fairly hard to find an open weekend to complete your project, which is why many home improvement experts site September to March as the perfect time for those outdoor projects. During these months, demand tends to be low, meaning deck builders, like Mid-Atlantic Deck and Fence, tend to have more openings. Mid-Atlantic Deck and Fence has been building custom fences and decks throughout Maryland since 1987. Today, we are one of Maryland’s leading and most innovative deck and fence companies. We take great pride in what we do and are confident we can not only meet, but exceed your expectations. With an average return on investment (ROI) of 87%, according to Remodeling Magazine’s annual Cost vs. Value Report, a new deck is easily one of the best ways to add value to your home, no matter which material you choose. Whether you enjoy hosting summer barbeques or just enjoy spending time with your family, a new deck gives you the perfect venue for those special occasions. Now you can enjoy the great outdoors from the comfort of your very own deck. Add an awning to shield yourself from the rain and extend that usability even more. Adding a deck will give your home an instant boost in the curb appeal department. Decks look good. Period. End of story. A new deck can easily add dimension to your landscape and visual appeal to your home. If you have any questions about how to make that New Deck a reality, please contact Mid Atlantic Deck & Fence (MAD Fence) today by clicking here or calling 1-800-833-9310. We proudly serve Anne Arundel, Baltimore, Howard, Montgomery and surrounding counties in Maryland.